Actually, electric dipole moments.... The new limit on the electric dipole moment (EDM) of the electron published by the ACME collaboration was already mentioned on blogs and in popular press. Here I will discuss in slightly more technical terms the significance of this result. So, the EDM of the electron is defined as a coefficient de of a particular operator that couples the electron field e to the electromagnetic (photon) field Aμ. By dimensional counting, de is expressed in units of 1/Energy or, equivalently, in units of length. The ACME limit reads |de| ≤ 8.7×10^−29 e*cm or |de| ≤ e/(2×10^14 GeV), where e is the electric charge. This is 12 times stronger than the previous best limit. The EDM operator is non-renormalizable as it has dimension 5 (actually, dimension 6 when it is rewritten in a form that is invariant under the Standard Model gauge symmetry). For that reason it cannot appear in the Standard Model Lagrangian, and the lowest order prediction is de=0. 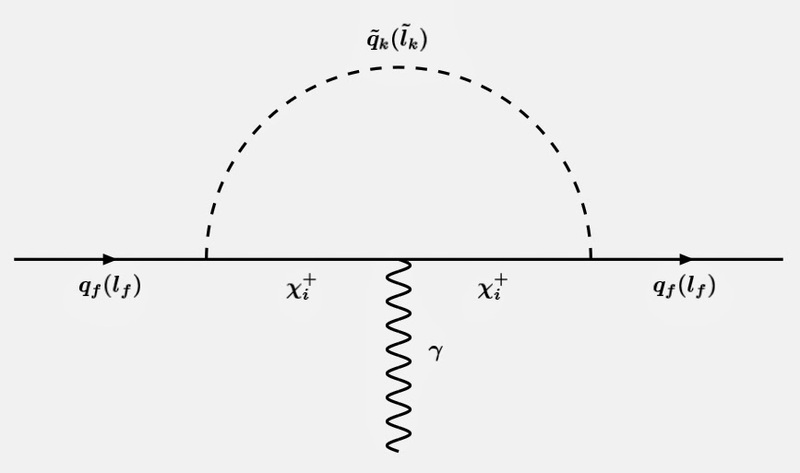 However, it can be generated by loop effects, much as the closely related operator responsible for the anomalous magnetic dipole moment of the electron. The important difference between these two is that the EDM, unlike the magnetic moment, violates CP symmetry. The Standard Model contains only one source of CP violation - the invariant phase in the CKM matrix. This invariant is proportional to the product of all the CKM mixing angles which are small numbers, therefore CP violating effects in the Standard Model are severely suppressed. Moreover, it turns out that the electron EDM arises only at the 4th order (4 loops) in perturbation theory. All in all, the contribution from the CKM phase is estimated as |de| ≤ 10^-38 e*cm, many orders of magnitude below the current experimental sensitivity. The neutrino sector may bring new sources of CP violation - the Dirac and Majorana phases in the PMNS neutrino mixing matrix - and these contributions to the electron EDM may arise already at 2 loops. Since we don't know the phases in the neutrino sector (or even the absolute values of the neutrino masses for that matter) we cannot compute that contribution exactly. However, we know it should be suppressed by neutrino masses squared and one can estimate it leads to Δde ≲ 10^-43 e*cm, even smaller than the CKM phase contribution. At the end of the day, the Standard Model prediction is de=0 for all practical purpose. That's great, because it means that the electron EDM offers a clean test of the Standard Model: a measurement of a non-zero value would be an unequivocal proof of new physics beyond the Standard Model. which leads to the limit M≳10 TeV for the mass scale of CP violating new physics. That's a less impressive but still a non-trivial constraint on models of new physics at the TeV scale. where g is the weak coupling in the Standard Model, and tanβ is a free parameter describing the supersymmetric Higgs sector. This is a very severe constraint for large tanβ, but also a non-trivial one for moderate tanβ. Of course, this kind of arguments does not robustly exclude supersymmetry showing up at the energies achievable at the LHC. The supersymmetric model could have a more elaborate protection mechanism (e.g. leading to a suppression by additional loop factors), or simply the CP violating phases could vanish because of the way how supersymmetry breaking is transferred to the observable sector (see here for one concrete example). But the simplest explanation of the current data is that there are no superpartners up to at least ~10 TeV. The most exciting aspect about the electron EDM is that there's still a lot of room for improving the experimental sensitivity. Therefore we will be able to indirectly probe new physics at even higher scales. ACME itself boasts that they can improve the limit by another factor of 10 soon. That would translate to a factor of 3 improvement in the new physics reach; that's by the way more than the energy jump from 8 to 13 TeV LHC... Clearly, the EDMs are one of our best chances to pinpoint the scale of new physics in this century. A new episode of the dark matter detection saga was just broadcast live from Sanford Lab. LUX is a new direct detection experiment located in a South Dakota mine, not far from Mt Rushmore. Today they presented their results based on the first 3 months of data taking. The red line is the previous best limit from Xenon100. The blue line is the current 90% CL limit from LUX, which puts them at the pole position in the entire mass range above GeV. They are the first to break the 10^-45 cm^2 cross section barrier: the limit goes down to 7.6*10^-46 cm^2 for dark matter mass of 33 GeV. To put it into perspective, the LHC can currently study processes with a cross section down to 10^-39 cm^2 (1 femtobarn). The inlay shows the low mass region where positive signals were claimed by CDMS-Si (green), CoGeNT (orange), CRESST (yellow) and DAMA (grey). All of these regions are now comfortably excluded, at least in the context of simple models of dark matter. So, the light dark matter signal that has been hanging around for several years is basically dead now. Of course, theorists will try to reconcile the existing positive and negative results, just because it's their job. For example, by playing with the relative couplings of dark matter to protons and neutrons one can cook up xenophobic models where dark matter couples much more strongly to silicon and germanium than to xenon. But seriously, there's now little reason to believe that we are on the verge of a discovery. Next time, maybe. The LUX paper is here.